IMAGE SIZE APX. 12X18 +/- FITS NICELY IN A STANDARD 16X20 MATTED FRAME. A FINE ART LIMITED EDITION GICLEE PRINT - ON WATER COLOR PAPER. SIGNED AND NUMBERED BY ELVGREN REPLICA ARTIST AND ART PUBLISHER. ONE ONLY AT THIS PROMOTIONAL PRICE! - PRICE SUBJECT TO CHANGE AT ANY TIME! (c) 1997 - 2007 All rights Reserved. Art by Daniel Vancas, who is the Elvgren exclusive replica artist! Are the words we hear when our gallery visitors see the original painting. This fine art print is of the highest quality. Enjoy this at a fraction of the cost of the original. A Great gift for those into Hot Rods, retro wear, vintage clothing, W.W.II and Korean War bird, nose art and aviation collectors; and of course those that love their Martini, swing, RAT PACK, Sinatra, Elvis, Marilyn and Rock A Billy set. Would look great by the dresser, pool table, bedroom, bathroom, game room, and with 1930's art deco furniture, original paintings and sculpture. Daniel Vancas has painted more than 238 replicas of Elvgren pin-ups They have confirm SOLD values of $3500 to over $5,000. Rarely ever seen outside of the gallery. ALL OTHER ELVGREN PAINTINGS shown as samples, are already SOLD! Photo's of the artist, Daniel Vancas at Elvgren's easel at work on other paintings. SEVERAL ARE COMMISSION REQUESTS. Select Commissions of his 130 image archive are full price, $3500 to $6500. Requests can be listed and confirmed on ETSY for requested sales if interested. HISTORY OF THIS ART: This was the art that was popular with the bomber crews WWII, ( and Korean War). This was the type of image popular for pinups copied on countless leather flight "Bomber Jackets" B-17, B-24 and B-29! Beautiful 1940's & 1950's Commercial, Aviation, Hair Salon, Auto shop and gas station pin-up girl. Daniel Vancas is a fine artist and fine art publisher of limited editions. Known mostly for his work in pinup, illustration, aviation and automobile art. He was the very first publisher of fine art Elvgren limited editions, and also the very first to commercially offer high quality Elvgren Replica paintings. He promoted Elvgren for 14 years at his own expense of over $1,000,000. Before Elvgren was rediscovered in the late 1990's and well before most of those popular new books came out, Daniel Vancas Owned and opened several Vanguard Galleries promoting Elvgren! He paid for shows all around the country promoting Elvgren pinup. He was the first to open Elvgren web sites in 1993 & 94. Because an estimated 40% of all of Elvgren's paintings were thrown away and lost, and because the found ones are rarely are for sale, unless offered at $75,000 to $150,000; Daniel Vancas was the first to paint the replicas of Elvgren pinups for the public, using mostly the destroyed, lost and unavailable Elvgren images. In this way he has faithfully and lovingly preserved many now lost works of art for another generation. At first he was licensed with B&B, now he owns his own separate elvgren Intellectual Property. Over the years he was also licensed by the VARGAS ESTATE, and bought and sold many vintage original vintage pinup paintings by Elvgren, Vargas, Petty, Moran and many others. Many celebrities and actors have been to his shows and gallery openings. Daniel Vancas painted over 238 ELVGREN REPLICA PAINTINGS! He has signed and dated back of each one, so they will never be confused with the original vintage painting by Elvgren. The reason you don't often see them for resale is because the collectors of these paintings keep them. Most are sold through galleries. DANIEL VANCAS IS AN ELVGREN I.P., TRADEMARK & REGISTERED VERO RIGHTS OWNER ON EBAY AS WELL. 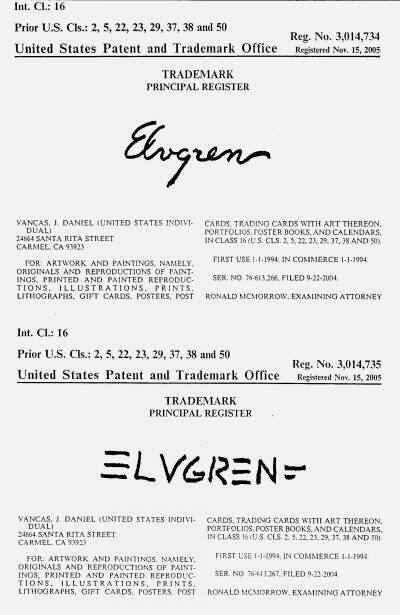 As a proud owner of the Elvgren trademarks, Daniel Vancas has use these marks continual since 1994, 1st issue 1997 and re-issued, final, over 13 year use, Nov.15, 2005. WE WANT YOU HAPPY. PLEASE UNDERSTAND THIS ETSY IS NOT HIGHLY PROFITABLE, SO WE TRY AND LIMIT OUR REFUND TO STORE CREDIT ON RETURN. EXCHANGE FOR SAME ITEM ONLY IF CLEARLY DEFECT, ON RETURN. SOME RARE CASES MAY REFUND PAYMENT BACK TO PAYPAL. THANK YOU FOR YOUR UNDERSTANDING. We reserve the right to sell to anyone and will refund if we reject your order for any reason. This by this statement agreement will not allow you you feedback bomb our good name and account. This is simply a free choice to decide who we wish to sell to.